Ham lore has it that man made noise on lower HF is radiated predominantly vertically polarised, this is offered and accepted by hams without explanation. It can be shown by simple observation that the ambient noise level on lower HF is quite different in business or commercial areas, residential areas, and rural areas (ITU-R P.372-12). Not only is there a significant difference, the change happens quite rapidly with distance which suggests there is a dominant component (man made noise) and that the propagation path is a very local one (ground wave). If you look around a typical residential neighborhood where hams might establish stations, the most obvious conductors that might carry and radiate noise currents from noise generators like appliances, leaky insulators etc are aerial power lines… which are usually closer to horizontal orientation (with horizontal E field) than vertical which seems inconsistent with the common observation that vertically polarised receiving antennas tend to capture more man made noise power than horizontal ones. This article proposes a mechanism that may explain the apparent inconsistency between noise radiators and noise receivers. 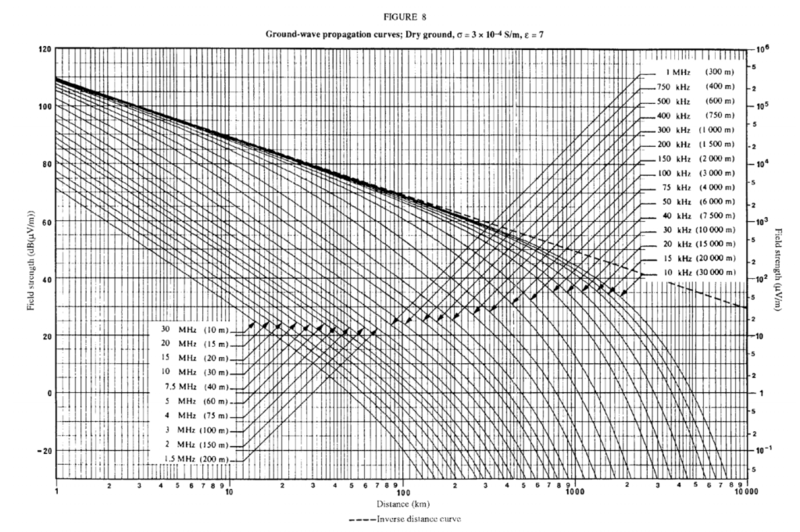 Though this explanation is based on experience, the quantitative analysis here depends on interpretation of Recommendation ITU-R P.368-9 (2/2007) Ground-wave propagation curves for frequencies between 10 kHz and 30 MHz. Whilst P.368-9 publishes a set of graphs like the one above for a limited set of grounds, ITU-R also publishes the program (GRWAVE.EXE) which can be used to calculate values for the user’s choice of ground and that is what was used for this article. 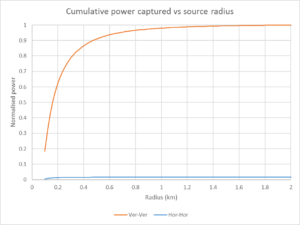 The graph above is for a vertical monopole over ground with 1000W radiated, the antenna has directivity of 3, and the dashed line (inverse distance curve) is the field strength for a lossless ground (PEC). This can be verified with a spot calculation at 1km. Above, the calculated field strength 109.5dBµV/m reconciles with the graph. 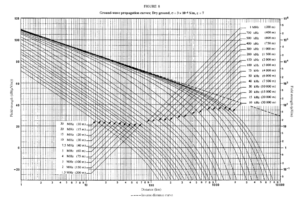 Note though that the field strength curves are frequency dependent, higher frequencies have lower field strength (higher path loss). Let us assume that the total man made noise captured by a receiving antenna is due to a large number of small sources distributed evenly around the receiving antenna. This analysis will use the propagation loss according to P.368-9 (using GRWAVE.EXE) to calculate the contribution of distributed noise sources around the receiving antenna. Let us assume that vertically polarised waves are radiated from the distributed noise sources and captured at the receiving antenna. sources within 100m radius are excluded (near field effects excluded). 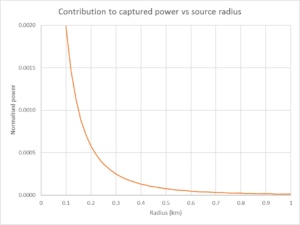 The graph above shows that the contribution of source falls with distance, initially quite rapidly, and this is due to a combination of inverse square law effects and surface wave attenuation due to the ground medium. We obtain a similar result, but attenuation is significantly higher and more so if the dipole heights are reduced. 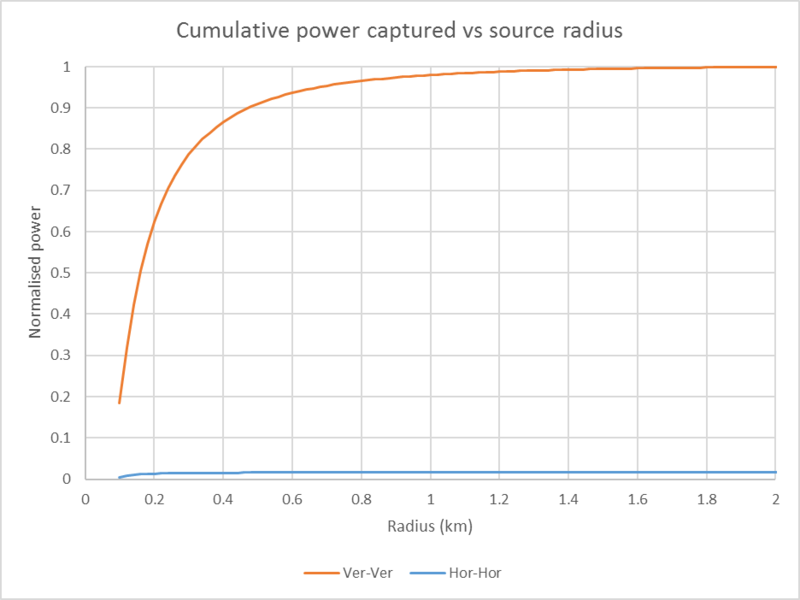 The plot above show the cumulative power captured for the Vertical-Vertical case and Horizontal-Horizontal, normalised so that total power captured V-V is 1. 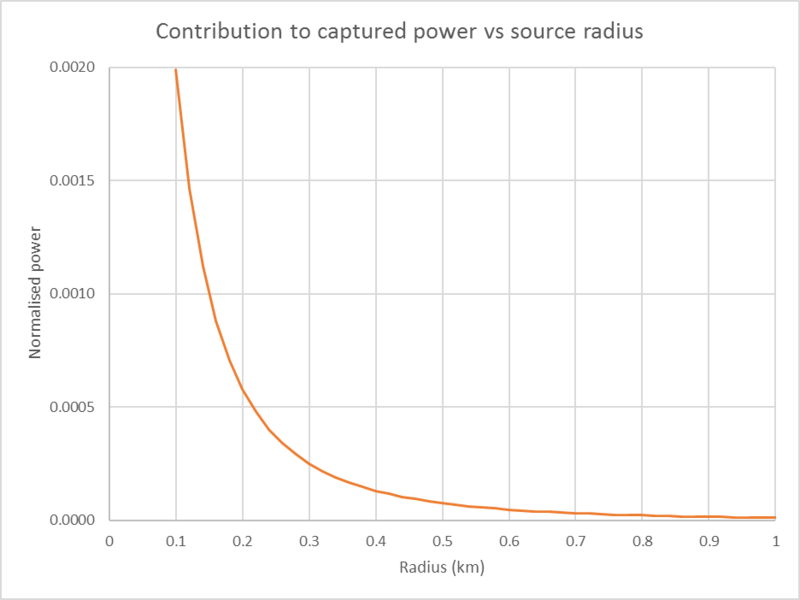 Note that 90% of the captured power for the V-V case is from sources at less than 500m distance. 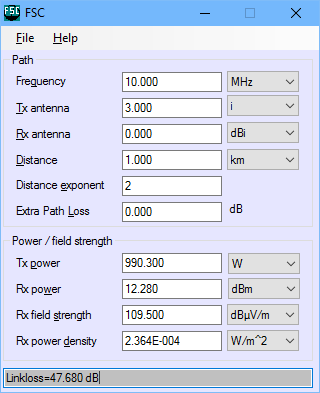 The power captured for the H-H case is much lower (~18dB) and 90% is from within a 300m radius. Ground wave attenuation means that most man made noise arriving by ground wave is very local, less than 500m in this scenario, and higher ground wave attenuation of horizontal waves results in much lower noise capture at a horizontal receiving antenna. The study treats ambient noise in isolation of signal, and as such is only a partial model but it seeks to explain the common observation that horizontally polarised antennas are “quieter”. Ham lore has it that man made noise is radiated predominantly vertically polarised, but that seems inconsistent with neighborhood conductor topology. A large part of man made noise is received by ground wave propagation. Ground wave attenuation is such that the capture zone for background level man made noise is quite small, and horizontally polarised ground waves are attenuated more than vertically polarised waves over that path, more so with distance. The analysis presents reasons why noise power captured from distributed random noise using a horizontally polarised antenna may be much lower than for a vertically polarised antenna. The models presented in this article are quite dependent on model parameters such as soil type, frequency etc, and whilst they demonstrate the influence of ground wave attenuation on polarisation mix, the results cannot be applied directly to other scenarios.